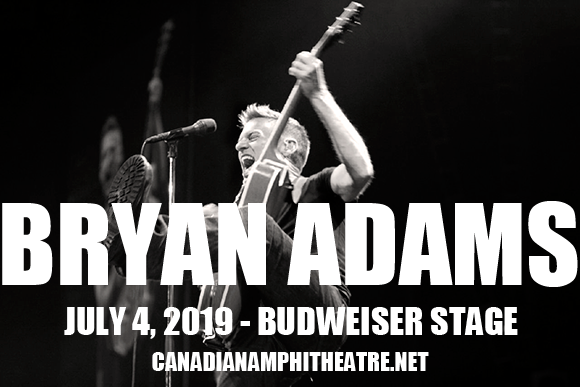 The one and only Bryan Adams comes to Budweiser Stage on Thursday 4th July 2019! The world-famous singer is currently promoting his most recent release, Ultimate, which features a bevvy of his most famous hits, including “(Everything I Do) I Do It For You,” “Can’t Stop This Thing We’ve Started,” “Summer of ’69,” and “Heaven” to name a few! Get ready for the concert of a lifetime as this phenomenal performer takes to the stage! One of the world's best-selling artists of all time, Canadian singer, guitarist, songwriter, photographer, and activist Bryan Adams (OC, OBC) is best known for his U.S. Billboard Hot 100 number-one singles "Heaven", "All for Love" and "Have You Ever Really Loved a Woman?". Adams found fame in the mid-1980s with his albums Cuts Like a Knife (1983) and Reckless (1984), which produced some of his best known songs including "Run to You" and "Summer of '69". Over the years, Adams has garnered several awards and accolades, including 20 Juno Awards among 56 nominations, 15 Grammy Award nominations (including a win for Best Song Written Specifically for a Motion Picture or Television in 1992), as well as MTV, ASCAP, American Music awards, three Ivor Novello Awards for song composition, five nominations for Golden Globe Awards and three nominations for Academy Awards for his songwriting for films. For contributions to popular music and philanthropic work, Adams was awarded the Order of Canada and the Order of British Columbia, and he was inducted into the Hollywood Walk of Fame in March 2011 and Canada's Walk of Fame, Canadian Broadcast Hall of Fame in 1998, and in April 2006 he was inducted into the Canadian Music Hall of Fame at Canada's Juno Awards. Adams was ranked 38th on the list of All-Time top artists in the Billboard Hot 100 50th Anniversary Charts in 2008.